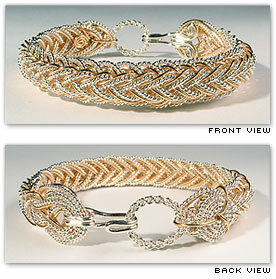 Pacifica Island Art proudly presents bracelets created by Varsha A. Titus. 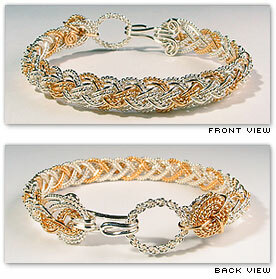 Varsha dedicates her designs to the intricate art of "Nautical Braids", known more familiarly among sailors as "Fancy Knotting". During the 18th and 19th Centuries, sailors' exploration of rope-knotting resulted in a historic contribution of almost 1000 fancy knot designs. 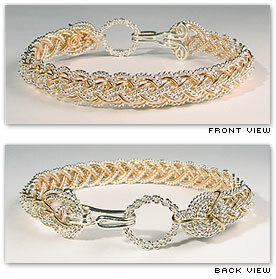 Handcrafted in her Maui studio, each bracelet created by Varsha is a documented and recognizable nautical design. 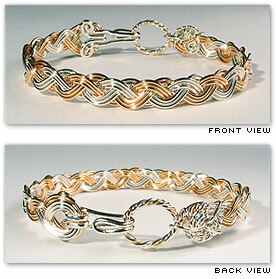 In place of the traditionally used rope, she weaves precious metal wires, twisting some and leaving others smooth. 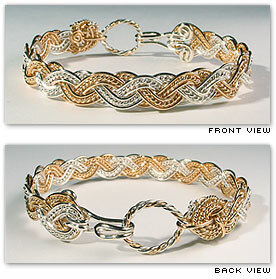 The clasps are uniquely hand finished and no soldering techniques are used. 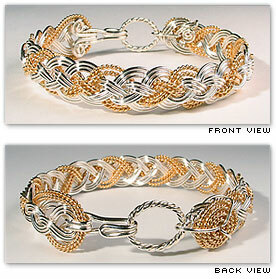 All "Nautical Braids" bracelet designs are offered in Sterling Silver as well as in 14K Goldfill, or in combinations of both. 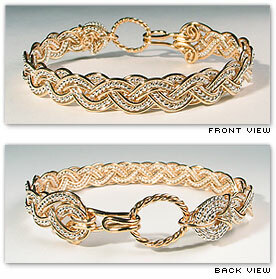 Not to be confused with the electro plating process, 14K Goldfill will not chip or wear away. 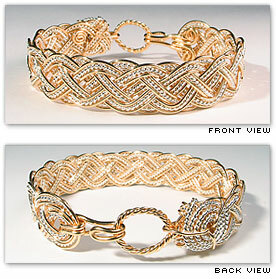 All bracelets are available for immediate delivery in standard size 6 1/2. To determine your wrist size use a soft tape measure and place it snugly over the wrist bone. 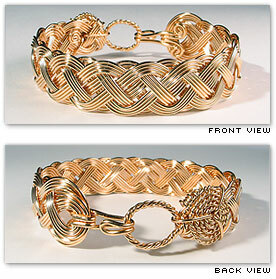 For sizes other than 6 1/2 please contact us at info@islandartcards.com or call 1-800-222-7327, and allow 2 weeks for delivery, your bracelet will be handcrafted for the perfect fit. Height: 11 mm. - Size: 6 1/2 in. Height: 9 mm. - Size: 6 1/2 in. Height: 12 mm. - Size: 6 1/2 in. Height: 7 mm. - Size: 6 1/2 in. Height: 8 mm. - Size: 6 1/2 in. Height: 14 mm. - Size: 6 1/2 in. Height: 13 mm. 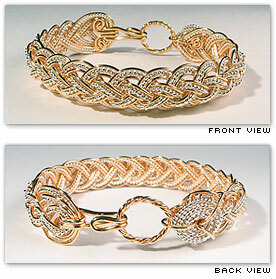 - Size: 6 1/2 in.